Chris Yates is probably the best known coarse angler of recent times, overshadowing even Richard Walker, and yet he has managed to achieve fame by running backwards away from the limelight at a steady trot. He is, of course, best known for his classic work, Casting at the Sun, which can make a serious claim to be one of the best books about fishing ever written and regularly turns up in informed top ten lists. River Diaries takes up where Four Seasons leaves off and charts the period when Chris turned away from his first love, carp, to pursue an even more enigmatic prey - barbel - although there is plenty of fishing for other species in here. The diaries on which the book is based were written over a three year period covering the period from June 1982 to March 1984 and tell of fishing on the Kennet, the Avon, the Rother, the Thames and a slew of ponds. This isn't a book about catching a record, nor does it make any pretence to be any more than the catalogue of days by the waterside, but it is suffused with Chris' own quiet brand of charm and if you want to know what it is like to fish with the master, then he tells the tale here better than a documentary possibly could. 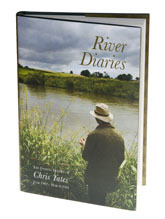 River Diaries is one of Chris Yates' most popular books and it is one that it is possible to read over and again.